Working in conservation land management and wetland restoration. In addition to following a personal inclination toward a creative outlet, I had a desire to influence ecological restoration design beyond the implementation I was already doing. I was attracted to Conway’s focus on ecology and whole-systems analysis. An intense, immersive, project-based program supported by a strong community and faculty. Conway will teach you an invaluable methodology for approaching any question, problem, or challenge. I’m liking using Land FX. It does a good job of simplifying and streamlining our CAD work for landscape design. 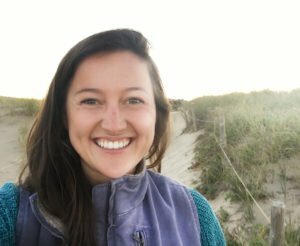 I’m working with two other Conway graduates as part of a small company on Cape Cod focused on conservation permitting, coastal/ecological restoration, and landscape design. I love being challenged by the task of designing landscapes that help people become more a part of the natural systems around them. I like learning about, and working with, coastal plant communities. I’ve appreciated learning how important it is in this field of work to be good at working with people (not just plants!). And as part of a small company my job has diverse responsibilities, which keeps things interesting! Ecological design can help reintegrate people into the balance of natural processes. It can show people a way of rethinking habits, lifestyles, or perspectives to live in sync with the natural world rather than to live as though we are separate from it.